Parham is strictly PPR to powered aircraft by air. Call the club on 01903 742137 or 01903 746706 before departing for Parham. 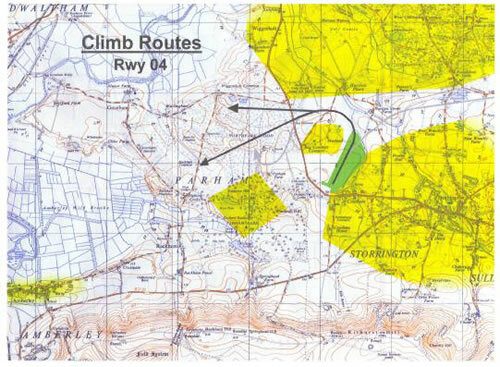 Our planning permission only allows aircraft to arrive that are connected with gliding. On this basis, powered traffic such as general aviation, microlights etc will generally not be granted permission to land. In an emergency, the airfield is, of course, available to any passing traffic with an urgent need to land. Parham has a grass runway of about 660m. Power traffic usually lands on the western side of the airfield either when landing on 04 or 22. 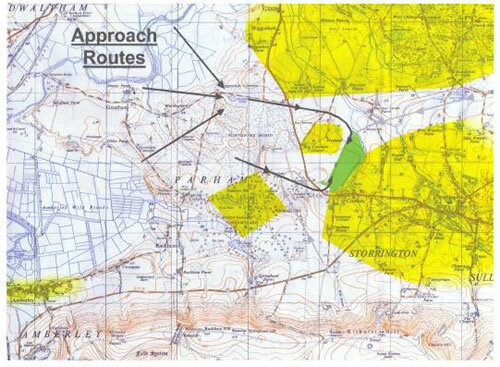 Circuits are flown to the west of the airfield to avoid the town of Storrington. The runway surface is smooth although can occasionally get soft in the winter months. There are trees on both approaches, although this is less of a problem landing on 22. Runway 22 is very slightly uphill. There are a few noise sensitive areas, clearly marked on the following maps. Specifically Parham House (to the South West), West Chiltington (to the North), and a small house complex to the NNW of the club must be avoided. 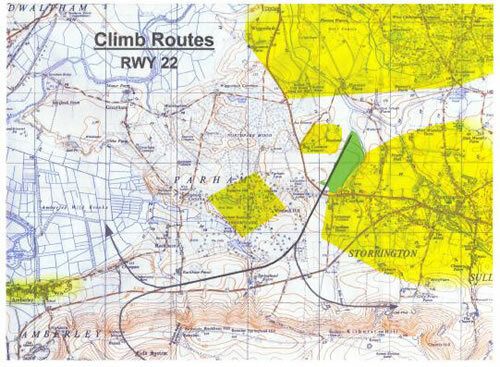 The following maps show the preferred descent and climb-out patterns to avoid these areas. Please call for joining instructions on 129.975 mHz . If no answer, transmit blind calls when joining downwind, stating planned runway, 04 or 22. Refueling facility is NOT available for visiting aircraft for insurance reasons.